I love this Shake to start my day out with. It’s like a guilt-free Mocha! 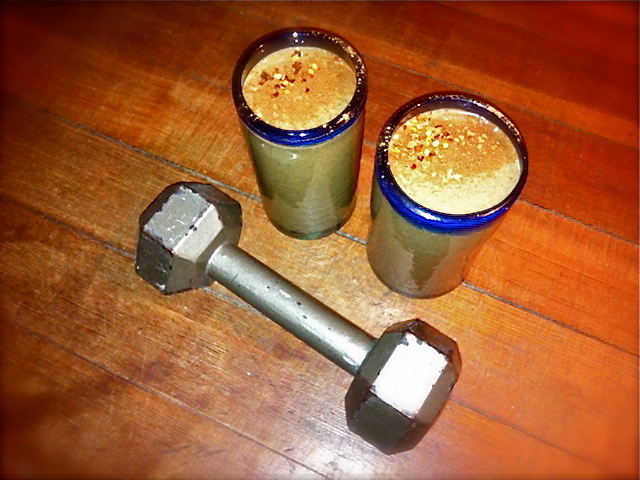 The Maca powder and coffee provide energy that’s even further kicked up by the spice! I choose to use Almond Milk for extra protein, but this shake would be delicious with creamy Coconut Milk or Cow’s Milk. Flax and Chia are my staple additions to all of my shakes and smoothies because they provide tons of essential Omegas that are helpful for vegetarians. It’s a perfect post-workout treat! In your blender, combine your choice of Chocolate Protein Powder, Bananas, Maca, Flax, Chia, Cocoa, Cinnamon and Cayenne. I used about a teaspoon of Cinnamon and Cayenne, but I also like mine with a lil KICK :) For less of a kick, use more Cinnamon than Cayenne. Fill your blender about three quarters of the way with Almond Milk and Coffee. The sweetener is optional depending on how you usually enjoy your Shakes. Top off with 7-10 cubes of Ice. Blend until smooth. Garnish with an extra dash of Cinnamon and Red Pepper Flakes and get your day started!